The Facts. Briefly, here are some of the facts of the case. The Defendant was seen forcefully throwing a tiny Yorkshire Terrier puppy into the street. Multiple eyewitnesses saw the Defendant and its aftermath. Additionally, the Defendant’s heinous crime was captured in full view by a surveillance camera from a building across the street. Fortunately, thanks to the attention of the witnesses, the responding police officers, the SPCA and the Westchester Animal Hospital, the little puppy survived. The Charge. Subsequently, the Defendant was charged with Animal Cruelty, under §353, Overdriving, torturing and injuring animals; failure to provide proper sustenance, of the New York Agricultural and Markets Law. Unlike §353-a, Aggravated Cruelty to Animals, which is a felony crime, committing the crime under §353 warrants guilt of a class A misdemeanor. While the punishment for a misdemeanor is capped at 12 months imprisonment, the ADA would not need to prove intent, increasing the likelihood of conviction. The Case. With an avalanche of evidence against the Defendant, most people, including the ADA, the defense attorney, and even the judge would have expected the Defendant to take a plea. But after months of conferencing between the ADA and the defense attorney, the Defendant would still not take a plea. And so, we started prepping for trial; contacting the witnesses, gathering all of our evidence and constructing our theory of the case. Finally, now that the incident was over a year old, the case was ready for trial. I experienced two full days of conferences, preliminary hearings and even jury selection. As the evidence mounted and the jury was selected both sides wondered why the Defendant would still not take the plea, which was minimal: time served. But the Defendant had a right to a fair trial and that was what we were going to give him. The Conviction. On the morning of opening statements the Defendant asked to watch the footage of the dog being thrown. Why, after months of preparation and being given multiple copies of the videotape, the Defendant had not watched it yet, I’ll really never know. So, after watching the footage of a man looking strikingly similar to the Defendant, which could be identified by our witnesses, throwing a puppy, which had belonged to the Defendant’s daughter, he took the plea. Why did the Defendant wait so long to take the plea? Well, it came out later that the Defendant felt as though he had gotten the short end of another deal in which he plead guilty. And so, even though this was a completely separate case, with completely separate facts, evidence and victim, the Defendant had refused to take the plea for so long in an effort to remedy what he felt was previously wrong. I had never heard of our legal system working in this fashion. This bizarre rationale for getting what the Defendant felt he deserved was far from my understanding of justice and a difficult one to figure out. Since at this point the Defendant had had us go so far into the preparation for this case, the ADA asked that the Defendant be sentenced with more than the original plea offer of time served. The Sentencing. While I was pleased to see the Defendant plea guilty to the violent misdemeanor I was curious to see what else, in addition to time served, his penalty would be. Would he have to serve a month in jail? No. Perhaps a few months probation? No. To my surprise the judge sentenced the Defendant to community service. Alright, I thought that sentence was a bit light, but then again I am a strong proponent of potentially rehabilitative opportunities. But then, the judge’s next statement shocked me and probably everyone else in that courtroom: “Mandated at an Animal Shelter.” What!!! The judge was actually sentencing a convicted animal abuser to serve his sentence at an animal shelter! The ADA politely protested that provision of the sentence, but the judge stood firm. He stated, “I believe the Defendant can learn compassion.” Perhaps he can. Perhaps he can’t. But perhaps we don’t test those waters out with innocent lives. Ultimately, the Defendant was rearrested the very next day and will never be able to fulfill his mandatory volunteering at the animal shelter. What I Learned. I am grateful to have worked on this case because I learned so much about the inner workings of an animal cruelty case. Of the many things that I learned I will take away three very important things. 1. The Witnesses made this case possible. This was a civilian-driven case. Ordinary people, like you and me, witnessed cruelty, made a point to actively stop the cruelty, attended to the victim, and after months of preparation took lots of time out of their busy lives by missing work and cancelling medical appointments to come to court and stand up against cruelty. Without them, this case, this victory would not have been possible and justice would not have been served. We owe everything to them. 2. The judge has great discretion. While most people, upon hearing the judge’s mandatory sentencing at an animal shelter, cringed and analogized it to having a child abuser volunteer at an elementary school, I still have great respect for the judge. 3. You never know what is inside the Defendant’s head. Not the ADA, the defense attorney, nor even the judge could figure out why the Defendant would want to go forward with such a case. Working in criminal law especially, you never quite know what kinds of weird and illogical rationales people come up with, but sometimes you just have to learn to deal with it. To learn more about charging considerations and sentencing guidelines in animal cruelty cases visit the Animal Legal Defense Fund website. You tell the sad story well, Angelique. I thought of some questions, which I hope you wouldn’t mind answering. Can you give your reasons for respecting the judge? Do you think a shelter is a place that teaches volunteers compassion for animals? Could a criminal become even more hardened doing community service work at a shelter if the staff, from the director on down, were themselves uncaring and abusive to the animals? Is a kill shelter the best place to learn how to value the lives of innocent animals? I’m curious: Why cannot the defendant serve the mandated community service time in addition to whatever sentence he receives if he’s convicted for the next crime he committed? Thankfully, the puppy wasn’t seriously harmed. As to sentencing the Defendant to work in an animal shelter so that he can learn compassion, I think the Judge was well intentioned, but perhaps naive. I trust, or at least would like to believe, the Judge did not see the Defendant’s behavior as pathological; and if this is correct, then his decision doesn’t compare to sentencing sociopathic child abusers to work in schools. But is it even possible to learn compassion for animals in a shelter? I think that depends as much on the Defendant as it does on the shelter itself. In my view, if the Defendant is capable of empathy and understands the difference between right and wrong, there’s a chance he can learn compassion from a shelter that truly shows kindness to animals — but if the shelter is willing to kill healthy and/or treatable animals, then he can only learn the duplicity that infects the animal “welfare” system. Thanks for reblogging, Buddy2Blogger and Wolf is My Sou! BlessUsAll, you pose some very interesting questions that I have spent some time thinking about. Regarding respecting the judge, maybe it’s just my nature, maybe it’s because I am in law school or maybe it’s because at the end of the day he has total discretion, but even though I don’t agree with his judgment, I feel as though I must respect the judge for making it. I give the judge the same respect I would have given the jury if the case had gone to trial, even if they had voted not guilty, I would still have respected their decision, even though I didn’t agree with it. Secondly, I absolutely think that an animal shelter is a great place to instill a sense of compassion in people, but I believe that it is more appropriate to do that when the person is young and still formulating thoughts about society and animals. For instance, I volunteer with a program called the Humane Education Project, where I, along with the Westchester County Animal Cruelty ADA and the Westchester County SPCA go to elementary schools and speak to the children about cruelty. However, the Defendant here is a “career criminal” with a lifetime of drug charges and convictions and I don’t think that the chances of him “learning” compassion as an adult are very favorable and even if they were, once a person is convicted of a crime against a certain class of victims, in this case, animals, they should be prohibited, or at least not encouraged by the court, from engaging with that class. I never thought about your third question and I appreciate you bringing it to my attention. I have unfortunately witnessed caretakers in animal shelters not being the friendliest towards their animals, so I certainly suppose that someone, who is already predisposed to acting violent, could become encouraged after witnessing it in an animal shelter. To answer your fourth question, I would say that it depends. If the animals were being killed purely for lack of space and resources then I would think it would teach a person, who is learning about the value of life, to disvalue animal life. However, if the animals were being euthanized because they they were terminally ill and suffering, then a person may be taught to acknowledge pain and suffering in non-human animals, which would help attribute more value to their lives, I would think. Lastly, most likely what happened after the Defendant was rearrested, was that he was incarcerated for the new crime and would not be able to fulfill his community service requirements and also that because he violated his probation (being rearrested prior to completion of his sentence), the Defendant will have a heavier sentence, beyond community service, to fulfill. Ellie Maldonado, thank you for your comments and questions. I agree, I certainly think that the judge was well intentioned, perhaps that is also why I still respect his decision (as I was saying in regards to BlessUsAll’s question). I also agree that the model the shelter displays would affect whether someone learns compassion from being there. Ultimately, I believe that rehabilitative opportunities are more effective than imprisonment in the long run, but I also believe that once a person has been convicted of animal abuse they should not be actively encouraged or mandated to take care of animals. Lovely answers, Angelique. Thank you for taking time to think the questions through. I’d forgotten all about them, frankly! You’re an earnest, caring, respectful individual with all the makings of being an honest, industrious, wise and fine lawyer. We can use more of you — especially in the field of animal welfare or, better yet, animal rights. I’m sure you’re familiar with the Nonhuman Rights Project’s landmark court filings on behalf of four chimpanzees in New York State. I hope every animal-friendly lawyer aspires to do that kind of precedent-setting work someday. Enjoy your well-deserved winter vacation and holidays. Thank you so much for your kind words and support, BlessUsAll! Yes, I am very excited to see what happens with the filings. Happy Holidays! I have a little question. At the moment I live in France but I have lived most of my life in Canada. No matter where I am I always see the same thing when it comes to animal cruelty cases. Here, for example, for the extreme cruelty somoene had inflicted on animals the penelty is 5 years in jail and up to 30 000 euros fine. Yet people who burn animals with acid and torture them to death, at most get 2 years suspended prison sentance. This means that they never even see the inside of the jail. If the animal is not dead it costs a lot to cover their medical bills. So here is the question. Judges say they don’t give jail sentances because the jails are full. Why not then hit these monsters where it hurst the most? Why not make them pay the 30 000 to cover the veterinary bill and to pay towards helping other animals? These days only loosing money hurts. Why not punish this way? This would realy help the animals in need and I can promise people would think twice if they risked loosing large amount of money. Hope you get close to a judge sometimes to ask this question. Good luck with your work, though I hope you fail to well defend people who abuse animals. Thanks for your comment. I agree that increased monetary penalties in addition to jail time will create greater incentives to avoid harming animals. However, this all depends on the statutory language and the nature of the crime. For instance, if the maximum penalty for animal cruelty is $1,000 fine then it can not be exceeded unless the law changes. This is where citizens and policymakers must work together, so that the law reflects society’s values. If constituents want increased penalties, then they need to petition their state legislature for it. 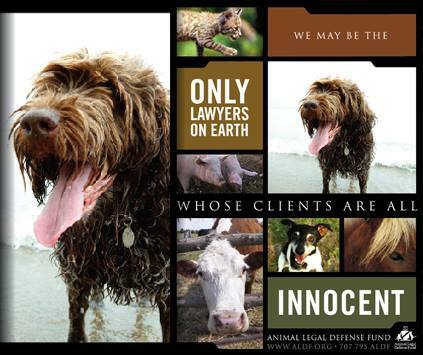 Currently, many attorney and non-attorney citizen advocates are utilizing private rights of action by pursuing civil lawsuits against animal abusers. This is another way to demand increased monetary penalties outside of the criminal arena and there is typically more latitude with the amount of damages awarded in civil suits. But again, this all depends on your state legislature and whether this kind of law is enacted. And if it isn’t, then create one and get it passed! I’m much less knowledgeable about the laws in France, but anywhere there is a democracy the citizens should be creating the laws they want.